Tip: Switch the setting to only show paragraphs near differences to avoid wading through reams of unchanged text. The eight links above each lead to a web page that finds the differences between plain text pasted into two of its text boxes. The first one is the simplest. It has no navigation from one difference to the next. The original and modified text are shown in the same pane with the differences highlighted in color. Its advantage is that its output window is large and unconstrained. The second one is like the first one, but it has navigation controls that go from one difference to the next. The third and fourth ones show the original and modified text into different panes. Navigation from one difference to the next is included. The third link has vertical panes. The fourth link has horizontal panes. The fifth one has an output window that fills all of the web browser. So long as you don't mind the original and modified text displayed in the same pane this is the best one. The last three links are duplicates, except the form controls are set above the result windows, allowing the latter to be made larger. Our text diff algorithm was developed from scratch and is an improvement on off-the-shelf implementations which inaccurately describe the movement of text as unlinked deletions and additions. The colors blue and gray are used to indicate that text has been moved. 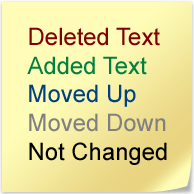 Green and red are used to highlight the addition of new text in the modified document (#2) and its deletion in the original (#1). Our code gives users the choice of comparing text at the level of whole paragraphs (or lines), individual words or characters. If you are interested in how individual sentences have been altered you should ensure Compare whole words is selected. No permanent or temporary files are made in the process of comparing your plain text; everything is done in memory. If you like our free web-based online text difference tool, please link to www.diff-text.com. The text compare software was originally written as a Windows desktop application, which we may publish at some point. The functionality available on this website is also available as a standalone Microsoft Windows desktop application. In addition, this software can compare folders, remove duplicates, supports the drag-and-drop of text files and has resizable results windows. This tool is really useful and you should try it! A free 30-day trial of this software can be downloaded from https://compare-text-files.com. Some of the functionality available on this website is available as a Microsoft Office add-in. Word and Excel are supported. Click here to get the add-in from the Microsoft Store. The screenshot shown below illustrates how the background color changes to alternately light blue and yellow to indicate that the sentences within a paragraph have been reordered. The text has been colored blue to indicate the whole paragraph has been moved up in the document. Not many text comparison tools are capable of indicating a paragraph has both been moved up and reordered at the same time. The software tries to guess if you are comparing computer source code and, if so, will automatically add line numbers and stop padding its output with blank lines. The options Always number lines and Never add blank lines override this behaviour. Don't show any identical paragraphs will treat a moved line, so long as it is unaltered, as no difference at all and omit it from its output. The option Look for moves is written for conciseness. It should be better labelled as Don't actively look for moves. When the algorithm is looking for moved text, it obviously cannot treat, for example, a single unmatched character or word at the beginning of the original document and at the end of the modified document as evidence of movement by default. There has to be more context. The drop-down list box labelled Minimum adjacent words (or characters).... adjusts the sensitivity of the software. If you want every single character or word to be considered for movements this should be set to 1. Uncheck Look for moves if you want the software to run faster and act more like a conventional diff tool. If navigation controls are available and you are getting stuck moving through a region of many adjacent changes, hitting Next Group will move you immediately to the next region of changes. If you want to know more, please consult our Frequently Answer Questions (FAQ). If you wish to contact DiffEngineX LLC please do so using the contact form on our compare-text-files.com website. By the way, we also make software to compare Microsoft Excel workbooks.